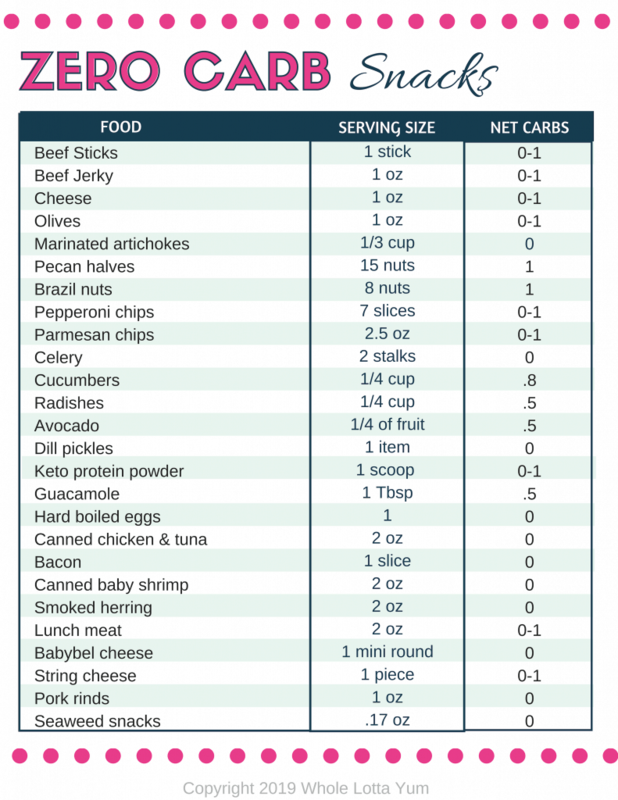 A healthy low carb and keto green chili casserole makes the ultimate comfort food dinner recipe when you need something quick and easy. 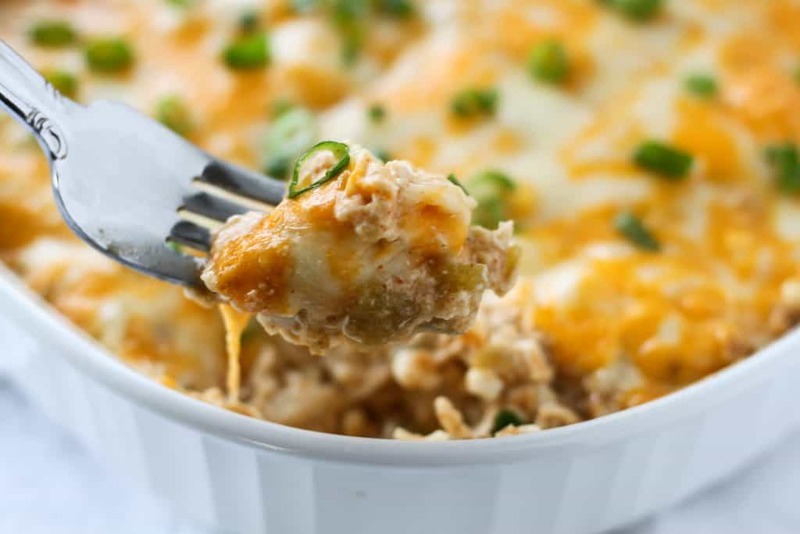 The combination of a savory chili verde sauce, three kinds of cheese and shredded chicken make for the best chili verde casserole you will absolutely love. I’ve been obsessed with whipping up low carb casseroles lately, just last week I made a keto taco casserole that was ammmazing! And now this week I used the same process and turned it into a green chili casserole with chicken. If you’re wondering which one tastes better, I’m going to call it a tie! My son devoured the chili verde casserole and declared it the winner. I’m always in love with anything that has green chilis and white cheese and could it that combo constantly. 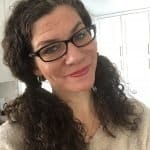 My husband preferred the keto taco casserole just “slightly” better but said both recipes were winners. 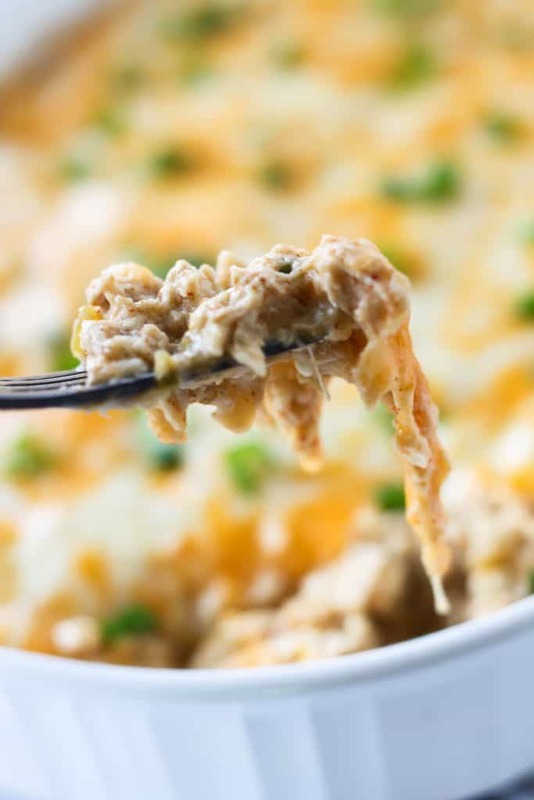 Whether you’re following a low carb or keto diet or not, you’re going to love this keto chicken casserole. I can almost guarantee you’ll make it often once you see how simple it is. 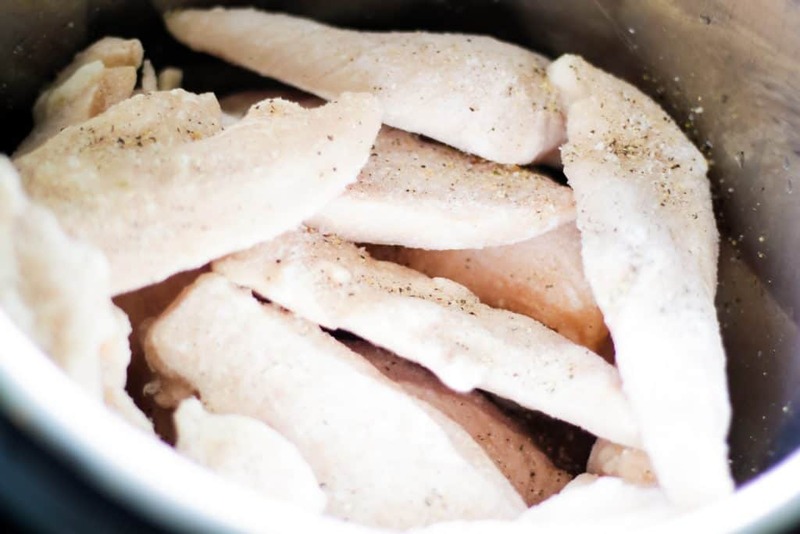 You’ll need to start with precooked chicken from the grocery store or pre-cook your chicken at home. 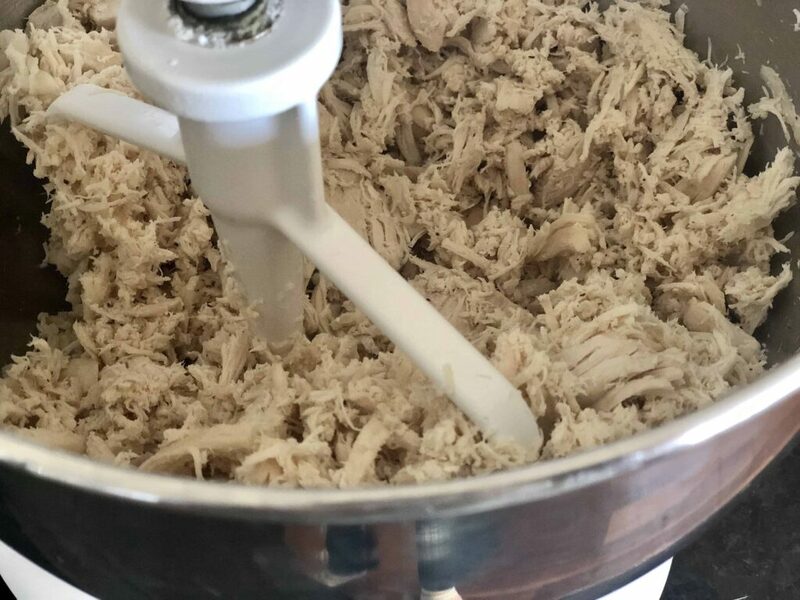 Cooking ground chicken on the stovetop would be the fastest method, I actually used an instant pot to make shredded chicken from frozen for this recipe. Instant pot chicken takes about the same time as roasting chicken to use for shredding (if you’re starting with frozen chicken like I did), but what I love about the instant pot is I can put it in and walk away, plus it doesn’t heat up my kitchen like the stovetop and oven do. Do you want to know a secret about shredding 2 pounds of chicken in ONLY 20 seconds? Use a stand mixer! You of course can also use a hand mixer if you don’t have something like a Kitchen-aid. But either type of mixer is a game changer when it comes to shredding chicken. No more awkward and tiring fork shredding! 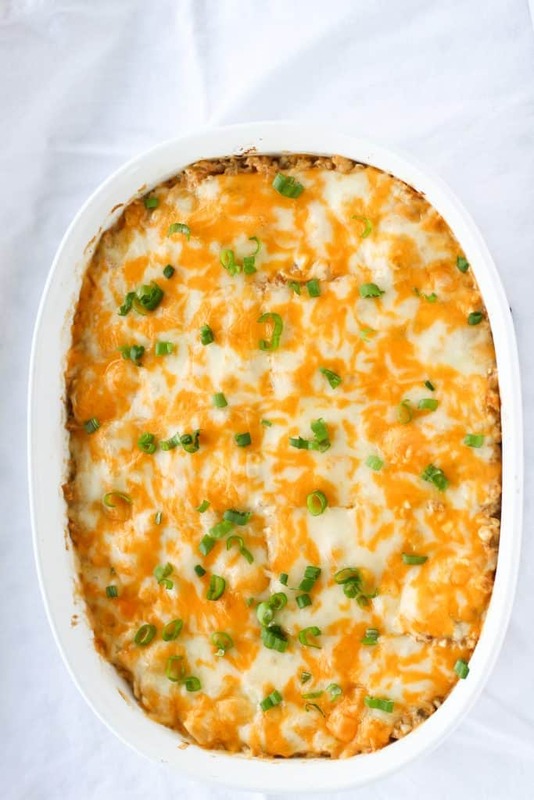 On additional note if you’re making this a keto chicken casserole, make sure to use full fat cottage cheese and also sugar free taco seasoning. This chili verde casserole is so simple to make and is definitely kid friendly too, it has tons of flavor but isn’t spicy. If you’re a spice lover like my hubby and son, feel free to add a spicier salsa, add in canned jalapenos, or add hot sauce after it comes out of the oven. 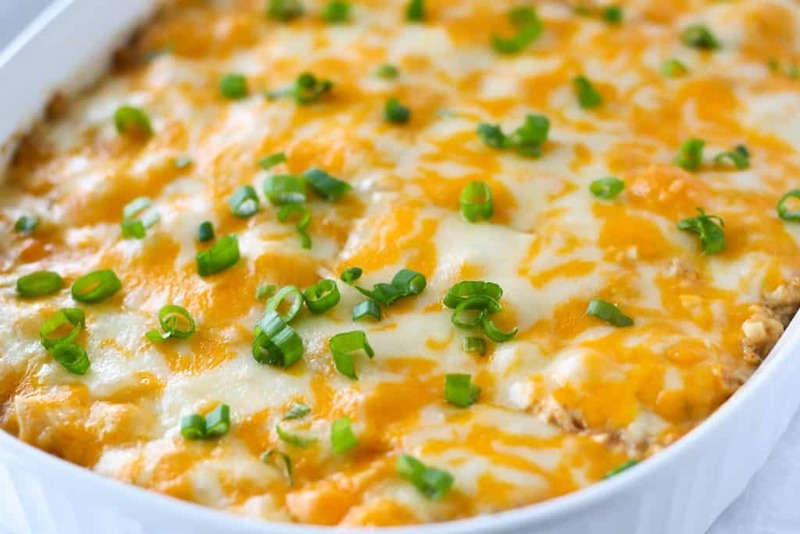 Once you have your chicken cooked and shredded, the next step to make this amazing yet so simple keto casserole is to dump all other ingredients in a bowl and mix them together (other than the chicken and the cheese). This means you’re adding the taco seasoning, green salsa, drained green chilis, and cottage cheese to the bowl. If you were surprised to see cottage cheese on the ingredient list instead of something like sour cream, it’s because cottage cheese holds its shape and adds a sweeter flavor to the dish. If we’d used sour cream this would’ve turned into something more like a hearty hot dip, which still sounds great! But we wanted a low carb casserole that was substantial enough for dinner. Cottage cheese is also our substitute for ricotta when we make lasagne. A little note about the salsa, a chunkier salsa works best but a runnier salsa still works great. We’ve now had it both ways with two different kinds of chili verde salsa and the runnier salsa left a little liquid in the bottom of the casserole dish after it cooled. But truly, it wasn’t a big deal but we just wanted to make you aware. In theory you could technically add the chicken at the same time, but I do it separately since it’s important to make sure the sauce blends evenly. The next step is to add the chicken and combine the ingredients well by hand. Spray the pan with a non stick cooking spray and add the chili verde casserole mix into the baking pan. The pan sized I used is 1.5 quart, which is equivalent to an 7″x11″ baking dish. You could also use a round casserole but then you won’t have as much surface area for your cheese, and who wants that? 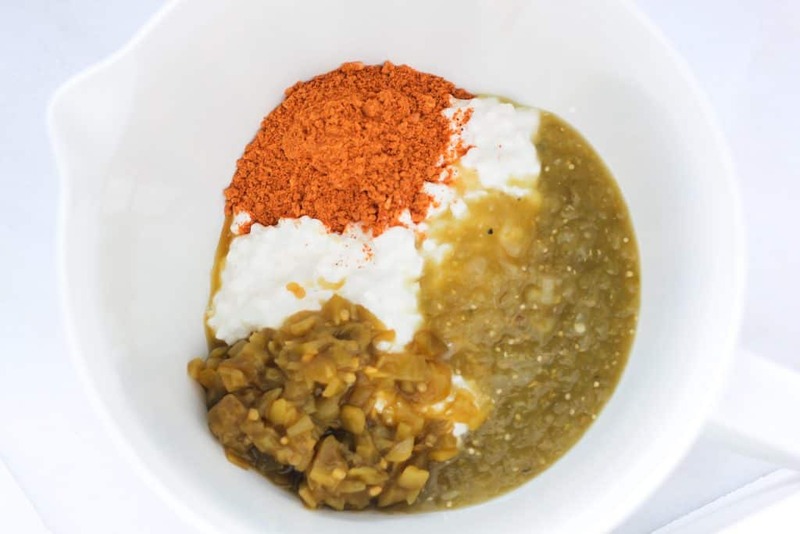 Slice 5 ounces of Colby jack or spread 5 ounces of shredded Mexican or 3 blend cheese and layover the top of the chili verde casserole mix. Bake in a preheated 375 oven for 20 minutes until the cheese is melted and bubbling. Garnish with green onions, chives, or cilantro, if desired. Serving this with sour cream, avocados and more salsa is delicious!! 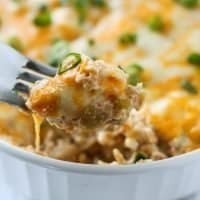 I highly recommend adding a dollop of sour cream to each serving of the low carb casserole. Be sure to post your feedback below in the comments! We’d also love to see your chili verde casserole photos by adding it to a Pinterest pin. An easy green chili casserole filled with 3 cheeses, chili verde sauce and shredded chicken. 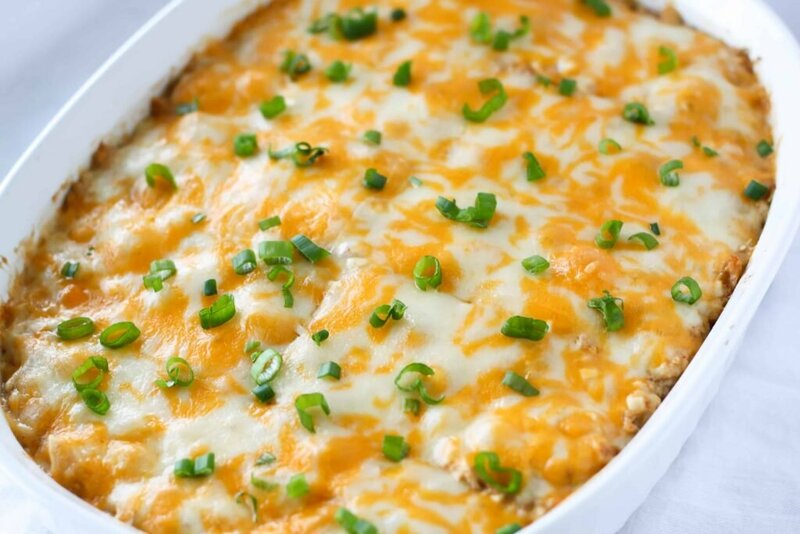 This recipe is also a gluten free, low carb and keto casserole too. 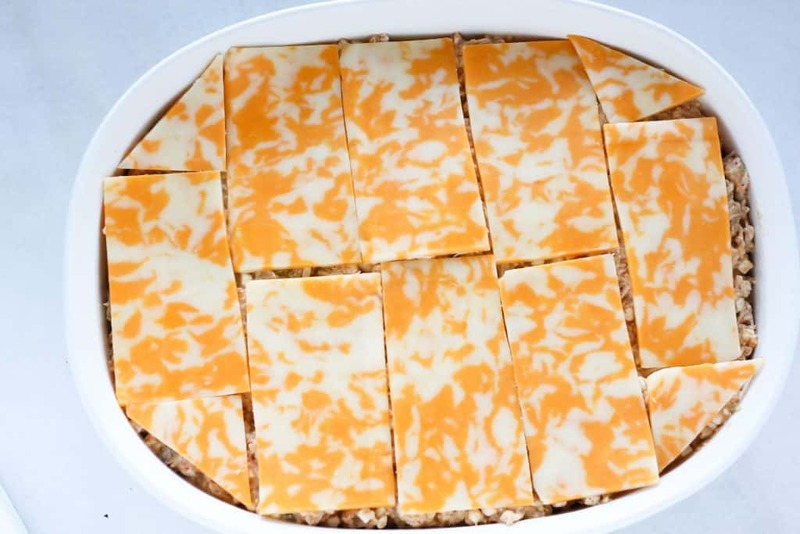 Bake for 20 minutes or until the cheese is melted and bubbling. We pre-cooked our chicken right before making the casserole, so the chicken was still warm, If you're starting with cold precooked chicken, you may need to cook the casserole a little longer. Using a chunkier salsa instead of a runnier salsa is also recommended. A salsa with more liquid may leave a little liquid in the bottom of the casserole after cooking.